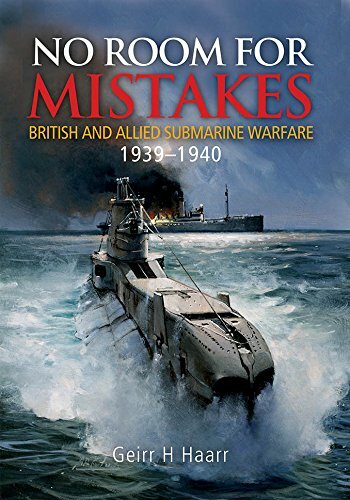 A fresh book from this bes-tselling author covering the events at sea in the early years of World War II, in which he has compiled comprehensive research and insight into a highly readable and detailed account of British and Allied submarine warfare in north European waters at the beginning of the war. The early chapters describe prewar submarine development, including technical advances and limitations, weapons, tactical use and life onboard, and examine the men who crewed them and explore their understanding of the warfare that they would become involved in. The core of the book is an account of the events as they unfolded in home waters from the outset of war to the end of 1940, by which time the majority of the Allied submarines were operating in the Mediterranean. It is a story of success, triumph, failure and tragedy, and it tells of the tremendous courage and endurance shown by a small group of men learning how to fight a new kind of war in claustrophobic, sub-sea vessels with limited information about the enemy, or what they would meet off the alien coasts to which they were heading. Extensive primary sources are used to document the many aspects of this war, some of which remain controversial to this day. Max Horton, Vice Admiral Submarines 1940, said: There is no room for mistakes in submarines. You are either alive or dead. This book makes plain how right he was.